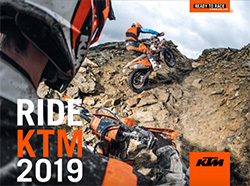 KTM ADVENTURE TOURS – bringing you action-filled motorcycle tours for more than 20 years. The recipe for success: Local tour guides who can travel quickly and know their way around accompany participants on the most stunning routes through the varied countries of Europe – including some genuine insider tips! Although we don’t skimp on luxury in some places, KTM ADVENTURE TOURS are really all about the pleasure of riding. There’s something for everyone: the Il Ciocco Offroad Center for demanding offroad action and luxurious accommodation; the Enduro island of Elba for newcomers and connoisseurs; and the mountains of Romania and Bulgaria for nature lovers. And we’ve now added the Dubai Desert Challenge to our portfolio for the desert foxes out there.